The fourth British Sea Power album isn't strictly a 'proper' British Sea Power studio album. In fact Man of Aran is actually the soundtrack score for the DVD release of the 1934 classic Man of Aran film. Whatever it is, the score here is undeniably British Sea Power. It pretty much sounds like what you will get if you have the band plays most of their album instrumentally. Man of Aran (the film) is a film/documentary of the hostile and harsh conditions that the people of the Aran Islands of the west coast of Ireland has to endure. Directed by American film maker Robert J. Flaherty, the film showcases a classic battle of wits between man and the elements of nature, such as basking sharks (essential for winter oil). There is barely any soil that can be used to farm. In this new DVD release, the film, which won the Grand Prix at the Venice Film Festival in 1935, has been updated with a modern score by British Sea Power (much like what Michael Nyman did with a Man with a Movie Camera). The score is powerful and moving enough to listen, though it is more effective when accompanied with visual cues (the DVD is bundled with the album). The DVD contains two versions of the soundtrack, one a studio version and the other a live version (recorded at Edinburgh Film Festival) in both stereo and 5.1 audio surround sound format. Perhaps not needing to deliver a 'proper' and commercially successful album, British Sea Power has delivered a very adventurous sounding album. It sounds more complex and aggressive than anything I have heard from their previous three albums, yet retain the signature post rock goodness we have come to love. The Brighton-based band cover Jeff Alexander's 'Come Wander With Me' (from a Twilight Zone episode) with a brilliant and haunting duet between Hamilton and Abi. The opening track 'Man of Aran' as well as 'Woman of Aran', 'Tiger King' and 'The North Sound' has a hint of Sigur Ros in them. 'The South Sound' and 'Spearing the Sunfish' builds slowly up from their subtle intros to a full blown post rock epic instrumental. Mental, but they work. A couple of previous songs has been recomposed for the score. The brilliantly epic 'North Hanging Rock' from Open Season can be found masquerading as 'Boy Vertiginous'. Similarly 'True Adventures' (also from Open Season) has been reworked as a 11-minute epic under the name 'It Comes Back Again', and the atmospheric 'No Man is an Archipeligo' once went by the name 'The Great Skua' (Do You Like Rock Music?) and sounds almost the same. I suspect the sceptics will view this collaboration as a long music video (the DVD is bundled with the album after all, and not the other way round), but whatever you do, listen to it via the enclosed DVD. Don't get me wrong, on its own British Sea Power's Man of Aran is a compelling album and offers plenty by itself. But watching the film with the new score is indeed the way to go. The often epic sonic experience coupled with the impact of Flaherty's enigmatic visuals of the people of Aran's hardship works great together. Do not miss it. 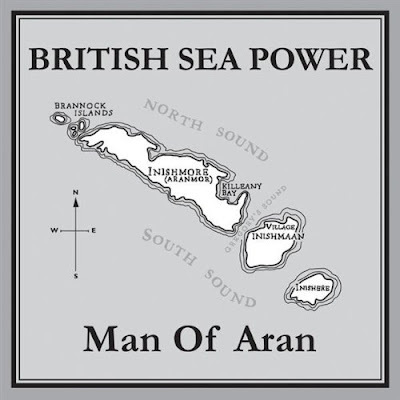 British Sea Power's Man of Aran is available as digital downloads at Amazon UK and Amazon.com, sans the film. Ah the pitfalls of digital distribution. Make sure to get the CD+DVD version here (UK) or here (USA), after sampling the album on Spotify. American film maker Robert J. Flaherty, the film showcases a classic battle of wits between man and the elements of nature, such as basking sharks (essential for winter oil). There is barely any soil that can be used to farm with the new score is indeed the way to go. The often epic sonic experience coupled with the impact of Flaherty's enigmatic visuals of the people of Aran's hardship works great together. Do not miss it.